There are a number of things your guests will remember about your wedding day, including the food you serve, the music you played and how you looked. If you want to ensure that they remember your look fondly, you'll want a hair and make up artist to help you create the perfect look. Those artists will work with your dress, your sense of style or personality and any accessories you want to wear too. Many of these artists offer a rehearsal or practice session before your wedding day. This gives you the chance to show the artist your dress and the veil, tiara or accessories you plan to wear. Your artist will work with you to create a style that works with the dress and makes you feel comfortable too. If you're happy with his or her work, you can schedule an appointment to work with that artist in the hours leading up to your wedding. 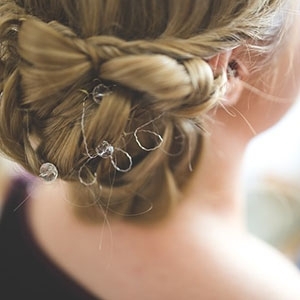 Your wedding day isn't the time to begin experimenting with different looks. Wearing lipstick, eye shadow, blush, foundation and mascara when you typically wear sunscreen and lip gloss will leave you feeling uncomfortable and may even change the way you interact with those around you. Find an artist willing to put your preferences first. After finding the perfect dress, shoes, makeup and accessories, it's time to think about your hair. You might want to wear an updo with a tiara that makes you feel like a princess, or you may prefer a more simple loose and long look. Ask your artist for some suggestions, but stick with a look or style that makes you feel both beautiful and comfortable. Work with artists to make sure you look as beautiful on the outside as you do on the inside on your big day. Kay Jewelers is the #1 Jewelry Store in America.